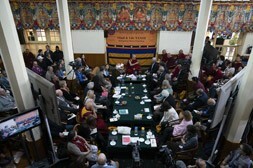 Since 1987 a series of dialogues between His Holiness the Dalai Lama and world’s leading scientists, philosophers and experts of different fields of knowledge have been organized at various locations around the world on a regular basis to critically investigate the themes of mutual interest concerning the nature of reality, consciousness, and the implications of recent developments in neuroscience, etc. These dialogues have brought two great investigative traditions-modern science and Buddhist teaching-together to explore and share each other’s perspectives and views on different aspects of reality. 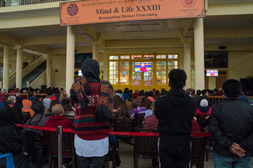 The 33rd Mind and Life Dialogue was held at the Main Tibetan Temple, adjacent to His Holiness the Dalai Lama’s residential compound in Dharamsala, Himachal Pradesh from 12 to 16 February 2018, It was organized and funded by the Dalai Lama Trust in collaboration with the Mind & Life Institute. This year’s Mind & Life Dialogue predominantly focused on the theme of “Reimagining Human Flourishing” by highlighting His Holiness the Dalai Lama’s profound commitment towards the introduction of secular ethics in the contemporary education system. 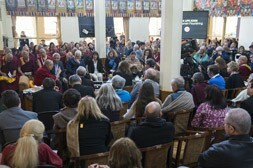 More than 300 participants from across the world including intellectuals, sponsors, guests, scholarly monks, and nuns were invited by the Mind & Life Institute and the Dalai Lama Trust to join the five-day Mind and Life Dialogue at the Main Tibetan Temple, to observe the interesting dialogues between His Holiness the Dalai Lama and western scientists, educators and philosophers on topics such as Early Childhood Development and Social-Emotional Learning, Meta-Awareness and Attention in Education Research, Ethics and Compassion in Education Research, etc. 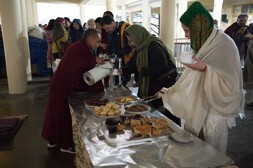 The Dalai Lama Trust funded all the expenses incurred on hosting, lodging, transportation, catering associated with the five-day dialogue including making badges, printing brochures, and making handbags for the participants and observers. 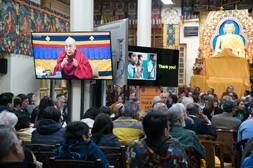 The five-day dialogue was broadcast live via social network sites like Facebook and the official website of His Holiness the Dalai Lama to worldwide audiences by the Audio & Visual Team of the Office of His Holiness the Dalai Lama. The Dalai Lama Trust also hosted a Tibetan cultural performance by the artists of the Tibetan Institute for Performing Arts followed by a simple dinner to all the guests of 33th Mind & Life Dialogue which had received great appreciation. 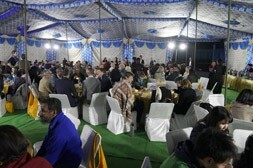 The presentations and dialogues for each day were divided into several sessions. 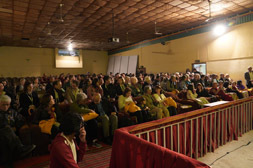 The morning sessions were highlighted by featured presentations and dialogues between His Holiness the Dalai Lama and presenters on their respective subjects and the early afternoon session focused on a discussion amongst the main presenters which was then followed by a question & answer session with the general participants including monks and nuns. The five-day dialogue between His Holiness the Dalai Lama and presenters with different academic backgrounds highlighting topics that were very much associated with human flourishing, and it turned out to be fascinating and enlightening to all the attendees. The purpose of the dialogue is, as His Holiness the Dalai Lama mentioned at the meeting, “to expand the scope of our knowledge and to promote warm-heartedness, and a greater sense of oneness of all human beings to tackle the crisis of emotions we witness today”. Patricia Jennings, Ph. D., Associate Professor of Education at the Curry School of Education at the University of Virginia. Robert W. Roeser, Ph. D., MSW. Bennett Pierce Professor of Care, Compassion and Human Development at the College of Health and Human Development at Pennsylvania State University.